The three concepts discussed in this article – earn-outs, indemnity holdbacks, and post-closing adjustments – are each mechanisms in a sale of the stock or assets of a company that provide a means for adjusting the purchase price to more accurately reflect the company’s value. Earn-outs provide for upward adjustment based on positive performance by the company post-closing. Indemnity holdbacks are a temporary reduction in the amount of purchase price paid to the seller at closing, held in escrow to be drawn upon to cover seller’s indemnity obligations to the buyer, thereby reducing the purchase price. Finally, post-closing adjustments to the purchase price are increases or reductions to the purchase price to account for changes in the company’s financial condition between signing and closing. A. What is an Earn-out? An earn-out is a mechanism to provide for contingent additional purchase price based on the company’s post-closing performance. Typically, an earn-out is structured as one or more post-closing payments which are payable if certain specified benchmarks are satisfied within certain specified periods. Benchmarks may be based on financial metrics, such as revenue or EBITDA, or be based on achieving certain other performance milestones, such as the number of new customers or completion of core product. If the target company fails to meet the specified benchmark within the specified period, the buyer is relieved from making the contingent payments or pays a lesser amount of additional purchase price. Earn-outs are particularly beneficial in the following circumstances: (1) fundamental disagreement exists on the target’s value due to uncertainty as to the company’s future prospects; (2) target is a start-up company with limited financial results and substantial growth potential; (3) the value of the transaction depends on integration synergies; (4) there is a significant pending event outside the control of the parties, such as resolution of litigation; (5) buyer desires to finance the purchase with future earnings; or (6) seller will continue to manage the company and buyer desires to motivate seller’s future performance. Inserting an earn-out into a deal structure may enable a seller and buyer to reach an agreement that would otherwise be unachievable due to their fundamental disagreement on the value of the company. These disagreements are frequently based on uncertainties related to the company’s future prospects and the parties’ differing levels of optimism. For example, a seller may believe the company is on the verge of a major achievement and time is needed for that specific prediction to bear out. A properly structured earn-out will compensate a seller for the true value of the company, as proven in future performance, while protecting the buyer from overpaying at closing. Earn-outs are particularly useful in dynamic or volatile industries. The Private Target Mergers & Acquisitions Deal Points Study conducted by the American Bar ‎Association (“M&A Survey”) shows that 38%, 25%, and 26% of deals surveyed in 2010, 2012, and 2014 respectively included an earn-out. The decreasing percentage of deals incorporating earn-outs from 2010 to 2014 may be attributable to the improvement in the general economy over that same period and a corresponding decrease in uncertainty regarding future prospects. Another scenario in which earn-outs are useful is a synergistic transaction. Such transactions are premised on the parties’ expectation that the target company is more valuable when integrated into the buyer’s business than as a stand-alone enterprise. Whereas a company is typically valued based on a multiple of past earnings, in synergistic transactions, such valuation methods may fail to capture the potential value. In these circumstances, earn-outs are useful to enable the seller to share in the benefit of the integration synergies that are difficult to value at closing. Earn-outs may also be used when the buyer has limited access to funds as of closing and will need to fund part of the purchase price based on the target company’s future revenues. This reduces a buyer’s dependence at closing on third party financing, and consequently may increase the number of viable bidders for the company’s purchase, resulting in an increased purchase price. Another benefit of an earn-out is to motivate a seller that will remain in management of the company post-closing to maximize future profitability. As discussed below, the parties will need to be careful in such circumstances, for accounting and tax purposes, to avoid characterization of the earn-out as compensation for services. While earn-outs offer attractive potential for more appropriately valuing a company, they also present significant risk of manipulation and post-closing dispute. Even if the parties use good faith efforts to avoid manipulations that impact earn-out, the profitability of the company after the closing can be affected by many factors unrelated to the company’s performance or intrinsic value, some of which are difficult to exclude from earn-out calculations. This can work to the advantage or disadvantage of either party, depending on the circumstances. For example, the buyer may make other acquisitions or changes to its business plan after the closing which can cause the company to be more profitable and achieve an earn-out target it may not otherwise have been able to achieve. Both parties are at risk with a poorly drafted earn-out provision. Especially where sellers will have management control post-closing, an inappropriately drafted earn-out can hinder the purchaser’s efforts to restructure the target, misappropriate future value to the wrong party or motivate the earn-out recipient to focus on short-term goals that will maximize the earn-out. If sellers are no longer in a position of control post-closing, the seller may suspect that the buyer is using different accounting techniques during the post-closing period to diminish the payout, or is artificially depressing revenues or earnings during the earn-out period, which may lead to a dispute. Sellers also generally fear that the buyer will not run the business successfully. Conversely, buyers face the risk that the payout formula will over-compensate the seller in some unforeseen way, due to other acquisitions or a change in the buyer’s post-acquisition business plan that essentially has nothing to do with the target company. These fears, many legitimate, should cause the parties to carefully craft the earn-out provisions. Security for payment of buyer’s future contingent payment obligation. Earn-out benchmarks can be financial or non-financial in nature, or a combination of both, and should be tailored to address the narrow area of dispute or uncertainty regarding the company’s value. Regardless of the type of benchmark chosen, the parties should ensure that earn-out targets are objective and easy to measure and compatible with the nature of the company’s operations. Common financial metrics used for the earn-out provision benchmarks include: (i) net revenue; (ii) net income; (iii) cash flow; (iv) earnings before interest and taxes (“EBIT”); (v) earnings before interest, taxes, depreciation and amortization (“EBITDA”); (vi) earnings per share; and (vii) net equity. Of these, revenue and EBITDA are the most common. Of the deals that included an earn-out provision in 2014, 19% used revenue and 39% used EBITDA. This represents an increase in the usage of EBITDA compared to revenue as a metric over the period from 2010 to 2014. Buyers should carefully analyze whether a proposed financial benchmark has the potential to distort the incentive for producing long-term, sustainable growth. Sellers conversely should analyze whether the benchmark leaves open the potential for buyer manipulation to minimize the earn-out payment. Revenue-based benchmarks are often more attractive to sellers than net-income benchmarks because they will not be affected by operating expenses or acquisitions or buyer’s changes to post-closing accounting practices. Buyers are more likely to agree to revenue–based benchmarks if costs of goods sold and overhead have little variability. Buyers generally favor net income benchmarks on grounds that they are the best indicator of the target’s success. In particular, if sellers will be continuing to manage the company post-closing, the buyer is likely to be opposed to revenue-based benchmarks because there is no incentive for management to control expenses, and revenue-based benchmarks may provide an incentive to generate short-term sales that may prove to be unprofitable. For example, an earn-out based on cash flow or income could provide incentive for the earn-out recipient to slash expenses (e.g. marketing and advertising costs) to bolster short-term profitability at the expense of long-term growth. Non-financial benchmarks often are used in acquisitions of development-stage companies, which are difficult to value, due in part to their high growth rates. Non-financial benchmarks can also serve the purpose of giving operational focus to the target. For example, the benchmark could be the completion of a new product, obtaining a particular large customer account or winning an on-going intellectual property lawsuit. Non-financial targets may be easier to structure and their achievement more objectively determinable. Additionally, non-financial targets may be outside the direct control of a party and therefore less subject to manipulation. Most earn-out periods conclude after the expiration of a specified length of time – generally between two and five years after the closing. The appropriate length depends largely on how long it will take to measure the projected value of the target or how long the buyer desires to incentivize the former owners. A buyer may negotiate a right to buy-out the earn-out early, which is exercisable in the event of sale of the company. This right is desirable to avoid hindering the ability to sell the company due to the on-going earn-out. A seller may want an acceleration of earn-out payment, or some liquidated damage amount, upon the occurrence of certain events that would otherwise preclude or impair the achievement of the earn-out, such as sale of the company, breach of operational covenants, termination of certain key employees, or bankruptcy or insolvency of buyer. In the case of the buy-out right or early acceleration right, negotiation of the payment amount may prove difficult. The formula for calculating the payment amount will be uniquely crafted for the particular transaction. It is common to financial benchmark earn-outs for the buyer to pay the seller a specified percentage of the amount by which the company’s performance surpasses the designated threshold. For example, the buyer may make an annual payment to the seller equal to a percentage by which the company’s EBITDA for the year exceeds the threshold EBITDA agreed to by the parties. In turn, the payment may be adjusted so that any shortfall in EBITDA from a previous year will reduce the payment otherwise due for the current year. Another common formulation is to establish a minimum hurdle before any payment will be made and provide a sliding scale or proration after that hurdle is achieved. For non-financial thresholds, the parties must agree upon an amount of consideration that will be delivered for each milestone that is met. The payout in any earn-out scenario is often capped at a specified amount. The seller should insist that the buyer maintain separate books and records for the company, division or other source that will be measured throughout the earn-out period. The buyer should covenant that these financial records will be made available for seller’s review upon reasonable notice. The buyer and its accountants typically will make the initial determination of whether the benchmarks have been reached. The seller then will review the calculations and challenge them if necessary. In certain situations, it may be appropriate to require that the results of the earn-out period be audited. For financial benchmarks, the parties should stipulate with as much detail as possible the accounting principles that will be used to calculate whether the thresholds have been met. To do so, the parties should consult with their accountants and financial officers. Simply referring to generally accepted accounting principles (“GAAP”) may be insufficient because GAAP encompasses a wide range of acceptable accounting practices. Likewise, if a non-GAAP measure is used, such as EBIT or EBITDA, the parties must use particular care in delineating the calculation principles that should be used. It may also be helpful for the parties to include sample calculations as exhibits in the purchase agreement to demonstrate the accounting methodology used. It is also important for the parties to anticipate certain potential post-closing events that could distort financial results from those that the parties desire to measure and adjust the calculations to exclude the impacts. For example, adjustments may need to be made if the buyer engages in post-closing acquisition. Other adjustments may be needed to reflect allocation of shared costs and expenses between the target company and the buyer’s other business, or to accurately reflect the target company’s performance if it is integrated into the buyer’s other business. Certain extraordinary items of expenses may be excluded. Among the most important provisions to draft if there is an earn-out are the company’s post-closing operational covenants. At a minimum, the seller should require language requiring the buyer to use good faith efforts to achieve the earn-out. In many jurisdictions, even in the absence of such language, the courts will find an implied covenant of good faith and fair dealing. However, this implied covenant leaves room for the buyer to make good faith business decisions that have an adverse impact on the earn-out. The seller should anticipate the most likely operational decisions that could adversely affect the earn-out and should propose post-closing operating covenants to specifically address those concerns. The covenants will necessarily be tailored based on the particular earn-out benchmarks. A buyer, on the other hand, will object to any covenants that are perceived as overly limiting the buyer’s freedom to operate the company and pursue the long term objectives of growing the company. 6. Security for payment of buyer’s future contingent payment obligation. Depending on the financial strength of the buyer, the seller may want to require some form of security to ensure that the buyer will pay the earn-out obligation. This security could take the form of escrowed funds, parent guaranty, security interest in the company’s assets or a letter of credit. The buyer’s lender will often seek to subordinate the earn-out payment to the lender's unsecured obligations, including seeking to limit payments while the lender's debt is outstanding. The seller should strenuously object to such limitations and require that earn-out payments be made when due unless buyer is in default under it loan agreements. A. What is an Indemnity Holdback? An indemnity holdback is a portion of the purchase price that is placed in a third party escrow account to serve as security for the buyer’s potential security indemnity claims against the seller. An indemnity holdback can alleviate concerns about the seller’s financial ability to cover post-closing indemnity claims if they should arise. In particular, buyers will demand a significant holdback when the purchase price will be distributed post-closing to the seller’s equity holders or there are multiple selling shareholders. In those cases, the buyer needs assurance that the purchase price proceeds will be easily accessible to cover a claim without the necessity of bringing claims against multiple individuals who may have already further gifted or spent the proceeds. Indemnity holdbacks are relatively common in deals. The M&A Survey revealed that in 2014, 77% of deals surveyed included an indemnity holdback, while 89% of deals in 2012 and 86% of deals in 2010 included the holdback. In addition to indemnity holdbacks, there may be other holdbacks from the purchase price to cover post-closing adjustment. The parties should consider whether there will be a single holdback escrow or separate holdback escrows for the post-closing adjustments and the indemnity obligations. Buyers generally prefer one escrow account so that more funds are available to satisfy potential seller obligations, whereas sellers prefer separate hold back accounts to isolate exposure of the holdback amount and provide for separate escrow release dates. In negotiating holdbacks, the seller may seek to further cap the indemnity exposure by limiting liability to the amount of the holdback. Alternately, the seller may require that any liability above the holdback will not be joint and several against the selling shareholders, but instead only several capped by the amount of purchase price proceeds an individual shareholder actually receives. However, as shown in the M&A Survey, the indemnity holdback is seldom the exclusive remedy. The M&A Survey reveals that in 2014, only 26% of deals surveyed provided an indemnity holdback as the exclusive remedy. The length of the holdback period will depend largely on the length of the survival periods for the indemnity claims. Typically most general representations and warranties have a survival period ranging from 12 months to 2 years, while certain other representations and warranties may survive through the statute of limitations period (e.g. tax, environmental, employment). The parties may negotiate for the indemnity holdback period to mirror the basic survival period, or may require that some amount of the holdback remain for a longer period to cover potential claims that are subject to longer survival periods. Whether the buyer requires the longer holdback period may depend on the perceived likelihood of recovering from the seller or selling shareholders directly, as well as any heightened concern regarding a particular potential indemnity claim. Generally, a bank or other financial institution will act as the escrow agent. These escrow agents typically have standard forms of escrow agreements under which they will provide services. While some terms in an escrow agreement are negotiable, most terms related to services provided by the escrow agent and the escrow agent’s liability exposure are non-negotiable. It is important to ask the escrow agent for their form of escrow agreement with sufficient lead time prior to closing. Among the terms of an escrow agreement that are negotiated are the provisions regarding distributions from escrow. The buyer will want escrow instructions that require the escrow agent to release funds to the buyer if, following the buyer’s notice of an indemnity claim, the seller has not objected within a specified time period. The seller will instead want to require that distributions from escrow will only be made upon joint instructions from buyer and seller or a non-appealable judgment against seller. The parties, particularly the seller, should also consider the tax implications of creating a holdback. Funds paid into escrow and later paid to the seller generally will be taxed under the installment method under §453 of the Internal Revenue Code of 1986 (“IRC”). Accordingly, the seller can defer a portion of its tax liability until it receives payment from the escrow. However, the seller must make interest payments to the government on the deferred tax liability of installment obligations generally to the extent they exceed $5,000,000 in the year they arose. In most holdback situations, the tax on payments received from escrow is based on the presumption that all of the escrow funds will be paid to the seller. Adjustments are then made in the subsequent year(s) if the seller receives less than the full amount. A. What is a Post-Closing Adjustment? Post-closing adjustments, or true-ups, are used to adjust the purchase price based on reconciling differences between the value of the company as reflected in the company’s latest financial statements prior to entering into the sale agreement and the value of the company based on financial statements as of closing date. The buyer will typically arrive at a purchase price based, in large measure, on information in the latest available financial statements and the earnings trend reflected therein. The need for post-closing adjustment can be especially acute when there has been a delay of several months between signing and closing, such as may occur when closing is delayed due to awaiting regulatory or third party approvals for closing. The purpose of the post-closing adjustment is to allocate to the seller the economic risk and profits of continued operation during the pre-closing period. In addition to post-closing adjustments for changes in the company’s financial condition prior to closing, post-closing adjustments are also used to reconcile certain estimated prorations of certain expenses and taxes made between buyer and seller at closing. Another type of post-closing adjustment relates to valuing accounts receivable that are included in the assets sold. The parties may agree to make adjustments based on the collectability of those accounts receivable during a specified period of time post-closing. To the extent the uncollectable accounts receivable exceed an allowance for doubtful accounts, the buyer may require a negative adjustment to the purchase price. The M&A Study revealed that most deals include a post-closing adjustment provision. In 2014, 86% of deals surveyed included such a provision. Within this subset, 51.5% of the surveyed transactions in 2014 based the adjustment on more than one metric. The “Adjustment Amount” (which may be a positive or negative number) will be equal to the amount determined by subtracting the Closing Working Capital from the Initial Working Capital. If the Adjustment Amount is positive, the Adjustment Amount shall be paid by wire transfer by Seller to an account specified by Buyer. If the Adjustment Amount is negative, the difference between the Closing Working Capital and the Initial Working Capital shall be paid by wire transfer by Buyer to an account specified by Seller. Working Capital”) was ______ dollars ($______). In reconciling the differences between the financial statements used to establish purchase price and the financial condition as of the closing date, the parties may structure the transaction to make a preliminary adjustment based on estimates as of the closing date. Alternatively, the full stated purchase price may be paid at closing (subject to any escrowed holdback), with a calculation of the purchase price adjustment made within a specified period, such as 90 days, after closing. In either case, the buyer may demand that a portion of the purchase price be put into escrow to ensure that the seller has funds available to pay any post-closing adjustment amount owed to buyer. 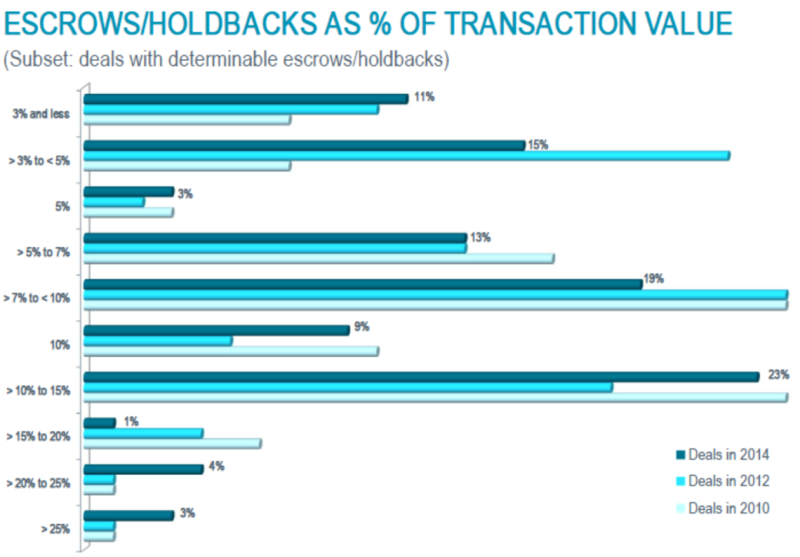 Based on the M&A Survey, 25% of deals in 2014 included a separate escrow for post-closing adjustments. Of the 75% of deals in 2014 that did not create a separate escrow, 50% provided for the true-up payment to be made from an indemnity escrow. In drafting the post-closing adjustment provisions, the parties should specify what accounting principles will apply. Before merely stipulating that the adjustment amount will be determined in accordance with generally accepted accounting principles (“GAAP”), the parties should be mindful that GAAP embraces a wide range of acceptable accounting practice and may change. The seller should be aware that the buyer, who will typically prepare the proposed post-closing adjustment based on closing balance sheet, may apply different accounting principles than were used by the seller in its pre-closing preparation of financial statements. Arguably for the purposes of accurately comparing financial statements, it is preferable to specify that consistent accounting principles will be used, pre- and post-closing. The parties may want to provide some specificity as to what those consistent accounting methods entail. Presumably during the due diligence period, the buyer reviewed the seller’s accounting methodology used in preparation of the financial statements and, unless specific adjustments were made based on that due diligence review, accepted that methodology. Moreover, the buyer’s reliance on the methodology is protected through certain representations and warranties that the seller makes to buyer with respect to its accounting practices and the fact that they have been consistently applied, as well as pre-closing covenants requiring the seller to continue to use consistent accounting policies. It is also helpful to schedule a month-end closing so that there can be an accurate comparison to the month-end interim financial statements used in negotiation of the transaction. Disputes can easily arise in the determination of the post-closing adjustment, making the dispute resolution mechanism in the agreement very important. Parties typically designate an independent accounting firm to act as an auditor and arbitrator in the event of a dispute. That accounting firm should be consulted prior to being named to confirm their willingness to serve in that role. Alternatively, if the identity of the independent accountants is not stipulated by the parties, the parties should specify the procedure for the selection of an independent accounting firm. The dispute resolution provision should specify whether the accountant is to examine only the disputed line items, or whether they may review the entire closing financial statements. For example, the Model Stock Purchase Agreement with Commentary, published in 1995 by the Committee on Negotiated Acquisitions, Section of Business Law of the American Bar Association (the "Committee"), provides for submission only of the "issues in dispute" to the independent accountants to address the uncertainty. To avoid the cost of third-party accountants' fees, the parties may want to consider setting a threshold on the amount in dispute with respect to a particular item before it is referred to the independent accountant. The parties will also want to specify how the cost of the independent accountants will be paid. Alternative methods include cost splitting, the non-prevailing party paying, or dividing the cost based on the relative deviation of the party’s respective positions from the determined amount. The dispute resolution provision should also specify (i) whether the process will include discovery and written submissions, (ii) whether the independent accountant’s decision will be final and binding, (iii) the time frame for determination, and (iv) whether interest will accrue during the process. These materials were prepared for presentation at the Oregon State Bar’s Nuts & Bolts of Oregon Business Law Practice held on November 18, 2016. Ayres, Jeffrey A., JPMorgan Chase Bank, NA, Jessica C. Pearlman, K&L Gates LLP, Janes Ross, Weil, Gotshal & Manges LLP, and Practical Law Corporate & Securities. "Negotiating M&A Escrow Agreements Checklist." Thomson Reuters. N.p., n.d. Web. 15 Nov. 2016. Belton, Tracy A., and Danielle N. Rosato. "Navigating The Minefield Of Indemnification Provisions - Law360." Law360. N.p., 18 Mar. 2016. Web. 16 Nov. 2016. Cassanego, Mark A. "Holdback Escrows in M&A Transactions | Carr McClellan P.C." Carr McClellan P.C. N.p., 21 Feb. 2013. Web. 15 Nov. 2016. Practical Law Corporate & Securities. "Earn-outs." Thomson Reuters. Practical Law, n.d. Web. 15 Nov. 2016. Practical Law Corporate & Securities. "Escrow Agreement." Thomson Reuters. Practical Law, n.d. Web. 15 Nov. 2016. Practical Law Corporate & Securities. "Negotiating and Drafting M&A Escrow Agreements." Thomson Reuters. Practical Law, n.d. Web. 15 Nov. 2016. Practical Law Corporate & Securities. "Purchase Agreement: Earn-out with EBITDA Targets." Thomson Reuters. Practical Law, n.d. Web. 15 Nov. 2016. "Private Target Mergers & Acquisitions Deal Points Study." American Bar Association. ABA Business Law Section, n.d. Web. 15 Nov. 2016. Walton, Leigh, and Kevin D. Kreb. "Purchase Price Adjustments, Earnouts, And Other Purchase Price Provisions." ALI-ABA Business Law Course Materials Journal (2006): n. pag. Web. The study looked at publicly available acquisition agreements for transactions completed in 2014 involving private targets being acquired by public companies. The final study sample of 117 acquisition agreements excludes agreements for transactions in which the target was in bankruptcy, reverse mergers, and transactions otherwise deemed inappropriate for inclusion. Asset deals comprised 17% of the Study sample. M&A Survey, p. 17. The exact percentages for 2010 and 2012 were not provided. M&A Survey, p. 96. In 2012, the average percentage was 7.83% and the median was 7.14%. In 2010, the average was 9.3% and the median was 9.19%. “Purchase Price Adjustments, Earnouts, and Other Purchase Price Provisions,” p. 6. M&A Study, p. 11. 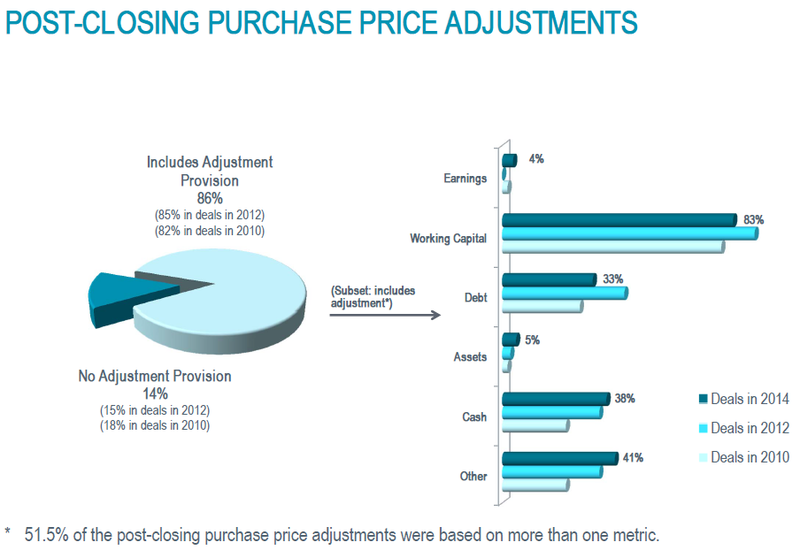 Transactions with post-closing adjustment provisions were 85% in 2012 and 82% in 2010. In 2012, 58% of deals provided for true-up payments to be made from indemnity escrow, and 43% of deals in 2010. M&A Survey, p. 15 .